The PM4i's integrated device management and diagnostic capabilities, provided through Intermec SmartSystems - and Wavelink Avalanche -, reduce downtime and simplify deployment. 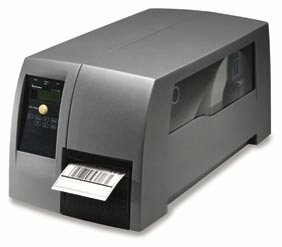 With its user-selectable, all-in-one programming languages (Fingerprint, IPL, ZSim, DSim), the PM4i fits existing IT infrastructures, deploying with drop-in simplicity to Intermec or mixed printer environments. Its secure, industry-standard connectivity options support easy integration and fast deployment. The rugged, all-metal PM4i incorporates features that reduce downtime and minimize maintenance costs. Its enhanced self-strip option delivers consistent performance across multiple media types. For precision labeling, its 406 dpi print head delivers exceptional, pinpoint accuracy. Replacing printheads is fast and easy, thanks to the magnetic QuickMount - printhead design. The PM4i is co-engineered and tested with Intermec labels and other media products, ensuring optimized, superior performance when used with genuine Intermec media. Multiple interface options are available, including the highest level of secure wireless connectivity (WPA2). The industry's only printers available with WiFi- and CCX-Certification, Intermec industrial printers help maintain wireless network integrity and reduce configuration time. Every printer ships with Ethernet connectivity, as well as with emerging network protocol IPv6, ensuring long-term, enterprise scalability. Other connectivity options - standard RS232 and USB ports, and optional parallel, double serial or industrial interfaces - provide additional integration flexibility. (107.5 in) at 300 dpi. 1016 mm (40 in) at 406 dpi. FCC and ETSI. Contact local representative for availability in particular regions. II supported (over UDP/IP), private enterprise MIB included. Supports IPv4 and IPv6.